An ancient subatomic signature extends across the universe. It seems that some subatomic particles, invisible and untouchable effects of the very creation of reality, might exist simultaneously across all of space. "Relic" neutrinos, like the relic photons that make up the cosmic microwave background, are leftovers from the hot, dense early universe that prevailed 13.7 billion years ago. But over the lifetime of the cosmos, these relic neutrinos have been stretched out by the expansion of the universe, enlarging the range in which each neutrino can exist. Of course there's a little bit of physics involved when you talk about particles pouring out of the beginning of time. Neutrinos are tiny, almost undetectable neutral particles which stream through pretty much everything, ever. Over one hundred trillion have passed through you while reading this sentence. Most of those came from nuclear reactions, but a blast wave of neutrinos were also released shortly after the big bang and are, we presume, still going strong. 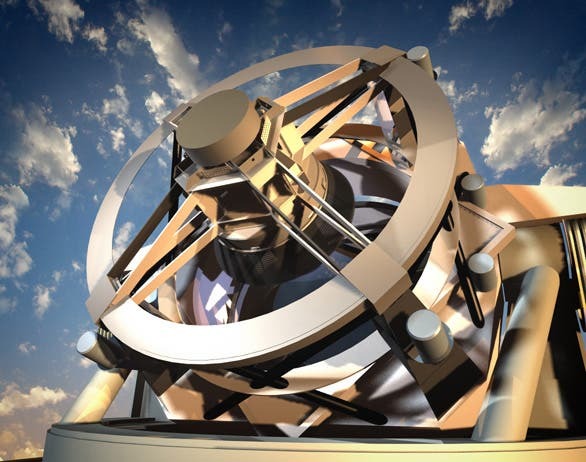 "We're talking maybe up to roughly ten billion light-years" for each neutrino, said study co-author George Fuller of the University of California, San Diego. "That's nearly on the order of the size of the observable universe." These oldest of the subatomic particles might each encompass a space larger than thousands of galaxies, new simulations suggest. While trying to calculate masses for neutrinos, Fuller and his student Chad Kishimoto found that, as the universe has expanded, the fabric of space-time has been tugging at ancient neutrinos, stretching the particles' ranges over vast distances. Such large ranges can remain intact, the scientists suggest in the May 22 issue of Physical Review Letters, since neutrinos pass right through most of the universe's matter. The big question is whether gravity—say, the pull from an entire galaxy—can force a meganeutrino to collapse down to a single location. "Quantum mechanics was intended to describe the universe on the smallest of scales, and now here we're talking about how it works on the largest scales in the universe," Kishimoto said. "We're talking about physics that hasn't been explored before." According to physicist Adrian Lee at the University of California, Berkeley, who was not part of the study team, "gravity is a real frontier these days that we don't really understand. "These neutrinos could be a path to something deeper in our understanding with gravity." Although they should be extraordinarily common in the universe, the relic neutrinos now have only about one ten-billionth of the energy of neutrinos generated by the sun. "This makes relic neutrinos near impossible to detect directly, at least with anything one could build on Earth," study co-author Fuller said. Still, the fact that there are so many relic neutrinos means that together they likely exert a significant gravitational pull—"enough to be important for how the universe as a whole behaves," Fuller added. "So by looking at the growth of structures in the universe," Fuller said, "you might be able to detect relic neutrinos indirectly by their gravity." The second part of this crash-course in cosmologically relevant physics is quantum theory. Particles can be "spread out" as a wavefunction – a representation of possible states – until they're observed and the wave collapses into a single fact. While that explanation is so horrifically simplified it would make a quantum scientists eyes bleed, it's good enough for now. The wavefunction of relic neutrinos from the big bang is on the length scale of the universe itself. They literally are sort of everywhere, because the only thing which can "observe" them is gigantic black holes or galaxies. The cosmic microwave background (CMB) is made of photons, particles that stopped interacting much later, when protons and electrons first combined to form neutral atoms, when the universe was 380,000 years old. That time works out to a distance from earth of over 40 billion light-years, accounting for the universe's expansion. Because the cosmic neutrinos "decoupled" much earlier, conventional wisdom has always held that they should originate from even further reaches of the universe than the CMB. But photons are massless, whereas neutrinos have a tiny amount of mass, which makes them travel more slowly than light. how the mass of neutrinos would affect the distance the relic neutrinos had traveled since they last interacted. Even though the relic neutrinos have been traveling for far longer than the CMB, their slower speed means they’ve covered much less distance. The cosmic neutrino background (CNB) originates from a distance of about a billion to ten billion light years away, much less than the 40-billion light-years for the CMB. The "particle soup" of the early universe was everywhere, and the relic neutrinos that reach us today simply come from different locations in that universe than the faster-moving CMB photons. Calculation reveals that the relic neutrinos originate from a range of distances where astronomical surveys are providing a wealth of information. The Sloan Digital Sky Survey is making detailed observations of the galaxies and galaxy clusters that inhabit these regions, and the upcoming Dark Energy Survey and Large Synoptic Survey Telescope in 2014, will add much more data. 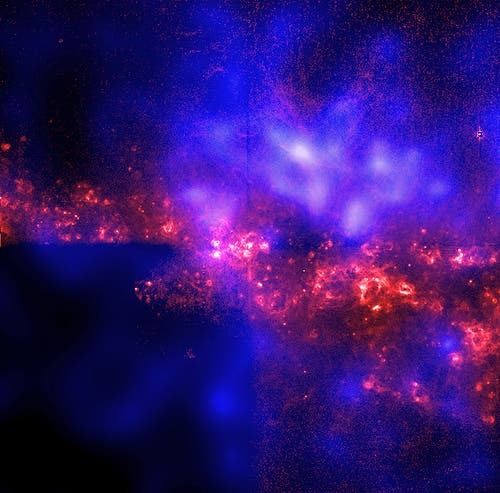 If experimentalists ever manage to precisely measure the CNB, it could allow cosmologists to connect the dots between the very early "seeds" of these regions–as imprinted in the CNB–and the galaxies and galaxy clusters that later formed. Such a comparison would give insights into many properties of the early universe, such as its dark matter and dark energy content. It's astonishing stuff, not just for the cosmo-experts but the casual fan. Because even trying to wrap your mind around such concepts is like a gym for your brain, and a booster for your sense of awe. Posted by Luke McKinney with Casey Kazan.